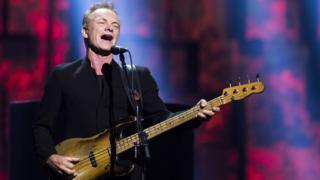 Image caption Sting's campaign for his Desert Rose single relied heavily on "sync licensing"
It seems quaint to recall that bands used to be accused of "selling out" if a TV programme or commercial used their music. Nowadays, rock and pop artists of all kinds have become reconciled to that particular way of doing what the Clash used to call "turning rebellion into money". So when did it all change? Well, one of the big turning points came when Sting not only allowed a carmaker to use one of his songs in an advert, but even appeared in it too. In the year 2000, Sting was having trouble selling his Brand New Day album, while radio stations were shunning its second single Desert Rose, a duet with Algerian rai music artist Cheb Mami. Then, in a landmark for what is now known as "sync licensing", the singer and his manager, Miles Copeland, had a brainwave. The video for the song showed Sting travelling in a brand new Jaguar S-Type car. So why not approach Jaguar's advertising agency and offer them the chance to make a commercial based on the video? "He was actually in the commercial," says Matt Bristow, who is business affairs manager at independent UK record label Cherry Red. "If you had gone back to Sting in the 80s and said, 'Would you fancy being in a car commercial? ', he would probably have said no." After that, the single reached the top 20 in 10 countries, including the UK and the US. And since then, sync deals placing music tracks in TV commercials, TV series, films and even video games have become steadily more important as a revenue earner for the music industry. With record companies unable to sell physical copies of their releases in the same quantities that they used to, they have sought other sources of revenue, and sync licensing is now one of the key ones. As a result, previously obscure job categories have come to the fore as the industry rebalances to reflect this. The 21st Century has seen the rise of music supervisors, people who oversee the process of finding the right song for a scene and making sure the right people get paid for it. These are the gatekeepers who decide which tunes you will be hearing in that latest hit TV show, the essential liaison between the creative types who make the programme and the business people who control ownership of the music. Cherry Red, like other record companies, fosters relationships with music supervisors and does whatever it can to make them aware of the music it has to offer. "If you go back a decade or more, I think certainly the bigger artists were not very receptive to these kinds of licences," says Mr Bristow. "When a thriving physical market was still with us, there was a view that you were selling out if you did that. "But that's changed. There's more awareness of the importance of maximising your income. "The door has definitely been opened. Artists at all levels are more receptive to doing these kinds of deals than in the past." Cherry Red's most notable success in sync licensing to date has been placing a song on the soundtrack on the hit Netflix show Stranger Things, which successfully applied to use the track Green Desert by German electronic music pioneers Tangerine Dream. "The approach came from Nora Felder, who is well known in the music sync world as a passionate music supervisor," says Mr Bristow. "We didn't haggle over the fee," he adds. "Obviously I can't tell you what it was, but it was comfortably in the ballpark of what that sort of deal would be." In this case, approval was required from the recording artists. Since Tangerine Dream's frontman Edgar Froese died in 2015, his widow Bianca was the one who gave it the green light. But the deal was not sealed until the final cut of the scene using the music had been signed off by the show's creators, at which point Cherry Red was able to invoice them for the money. "That's really great for us, it's like having a calling card when we go and see other music supervisors," says Mr Bristow. "When we say we've got a track on Stranger Things, they immediately know what we're talking about." When music supervisors are seeking to obtain permission to use a track, they need to clear two different sets of rights: the rights to use the actual recorded piece of music, known as the "master rights", and the rights to use the written composition, or the "publishing rights". "It's very attractive in the sync world when you control both rights and they can just clear with you," says Mr Bristow. "It's a one-stop shop when you control both rights." When Cherry Red signs a new artist these days, the label is seeking to acquire both master and publishing rights. However, music publishers and record companies have different priorities and it can be hard for one firm to give equal weight to both. As a result, musicians have traditionally been reluctant to put all their eggs in one basket, so that's another way in which the industry is having to change. "It's an old adage that you don't put your masters and publishing in the same place. It's historically the unwritten rule in the artists' community," says Mr Bristow. At present, Cherry Red controls the master rights of about 50,000 tracks and the publishing rights of about 16,000. The major labels - Universal, Sony and Warner - own far more tracks, especially the well-known big hits that are sought after by advertising agencies. But as an indie label, Mr Bristow says, Cherry Red can be "flexible on price" and sometimes benefits when the song that the ad agency wanted to use turns out to be too expensive. "When the music supervisor has been given a big-name track and they just can't clear it for the budget, they're looking for something that sounds similar," he says. Mr Bristow says the amount of money coming in from sync licensing is set to grow. "It's still pretty small overall, but it's increasing, the opportunities are increasing. "The more depth and breadth in catalogue you have, the more opportunities there are in the sync world."